Today I am over at Parade Magazine again. 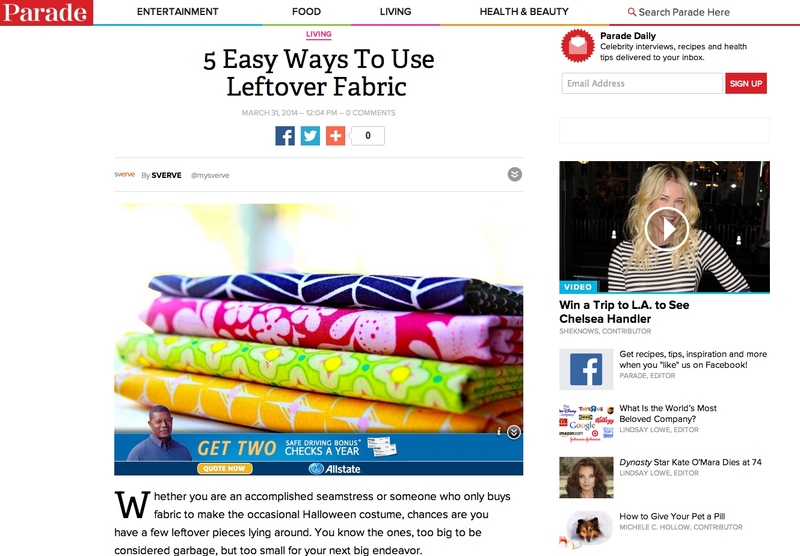 I have an article there detailing five easy ways you can use your leftover fabric scraps. You see, I have become a bit of a fabric junkie in recent years. I have bags of colorful material just waiting to be used for projects big and small. I'm actually chuckling as I write this post, because when I was kid, I had the greatest aunt, Auntie Vi. She was one of the most creative woman I have ever encountered and honestly, she is responsible for the large majority of my crafting talent. She taught me how to cross stitch at a very young age and I would say that she definitely lit the flame. Anyway, I used to laugh, because she had a bedroom completely devoted to her fabric stash. She used it mainly for quilting, but she did make other things, like prom dresses. When she came to visit, we would go shopping with her and I remember thinking, what could she possibly need more fabric for, didn't she have enough? Ah, silly girl, now I know better! If you pop over to Parade, leave me a comment there and let me know which project you like best and if you are a fabric junkie, too! I just linked over and read your article, good stuff. :) Your aunt sounds like my kinda person. Thanks Kim! You are so sweet and Auntie Vi would be so proud of you! She loved teaching you how to knit and sew, etc., she always said she never knew what to teach my boys, so she taught them to make scrambled eggs! All fantastic ideas for using leftover fabric! The pillows are adorable and I've always loved curtained cabinets and these are very cute! Thanks Poppy! Some creative readers left more ideas that I can't wait to try out...and use up even more of my stash! Very good article, Kim. I left a comment there, and will tell you here that I have a bunch of scraps -- and I mean scraps, not just leftover fabric -- that I can't bear to part with. I'm always looking for more ways to use them up. Why is it, though, that the more I use the more my stash seems to grow? I have that same multiplying stash, Nancy! Thanks for leaving me TWO comments! There are some really great ideas in the comments on that post, very creative! Maybe we can use up our stash material yet! Great article! I'm a placemat and accent pillow girl but also like the sachets, too! Thanks for your visit and happy anniversary to you!! Thanks so much! The sachets were new to me, too, but they are pretty!